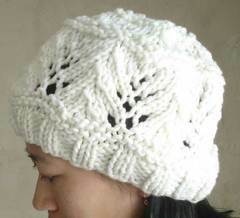 Knit this stylish hat in an evening. And it takes only about 109 yards or yarn! The wide ribbed border ensures a nice, comfy fit, while the vine lace and garter stitch bands give it a wonderfully textured look that is both feminine and sporty. Super quick and pretty easy to make. The simple lace pattern requires only basic lace techniques. It’s a great project for instant gratification. Optional tighter ribbed band instructions included. Hat is worked flat in rows, then seamed up quickly in back. Actual Gauge is 8 sts and 11 rows = 3” in St st. 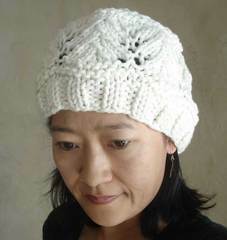 FINISHED HAT CIRCUMFERENCE: Approx 24” 61 cm at bottom as shown with loose fitting ribbed band. Optional instructions included for a tighter ribbed band, which is approx 20 ½“ 52 cm at bottom.